My granddaughter, Ashlee, is a child who has never had the opportunity to be spoiled. She is being raised by a single mom who has limited funds. Ashlee has spent many of her young years in the daycare system while her mother is working. Ashlee loves music and sings along to many of the songs on the radio. Now, I know I’m her grandmother, but she is a very curious, thoughtful, happy and quiet child. In fact, she is quiet to the point of being shy, and has the most gentle soul. In late 2002 my daughter Shawnna was laid off from her job as a daycare worker. After that time, of course, she cared for her daughter at home. Ashlee told me that she missed going to “school” (school is what she called her day care) and that she missed playing with her friends while at school. In 2004, Ashlee turned five years old. She was a little small for her age, but very ready and anxious to begin kindergarten. She was so excited to be going to school she could hardly contain herself. When the first day of school finally arrived, my daughter took Ashlee to school. Ashlee was thrilled and eager. My daughter was a little sad and nervous to see her baby go off to school, as all young mothers are. When it came time for all the mothers to leave their young new scholars with the teacher in their new classroom, Ashlee noticed another youngster was crying and clinging to her mother. Ashlee walked over to the crying child and simply said, “Don’t cry, I will be your friend”. Her few words made a world of difference. The other child was calmed and they both had a new friend. Both moms were a little less anxious about letting their children venture out in the world of education. Both moms were a little more humbled. My daughter saw that Ashlee could handle herself in this new world of kindergarten. The other child’s mother was confident she was not leaving her child alone. Couldn’t we all learn a lesson or two from the innocence of children? They are young enough to see beyond race and religion, beyond differences of any and all kinds. Children are able to see the fear of another person, and find a way to comfort them with a simple gesture of friendship. I know I am quite biased, but someone has taught Ashlee to feel and to freely express those feelings. 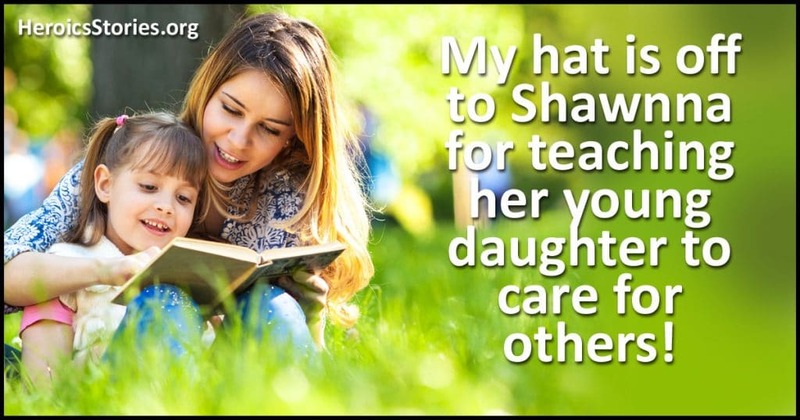 My hat is off to Shawnna for teaching her young daughter to care for others! And hat’s off to Ashlee, for reaching out and comforting her new friend.